As I was reading through a printed draft of WHEN THE LIGHTS GO OUT AT 10:16, I kept trying to put my finger on this essential element within the story that was missing. This key piece. The story as it currently exists has many gaps and holes that need to be filled. I’m very well aware of this—and part of my job as I work through the draft is to mend these holes I created in 2003, and then again in 2007. What is missing from the story? Then it hit me. What was missing. 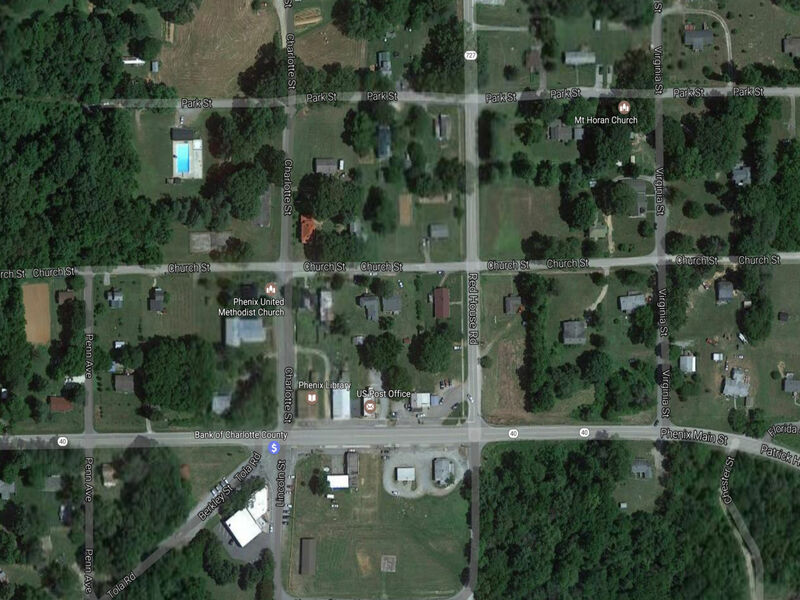 This teeny tiny town in southern Virginia where my childhood was birthed. Phenix is mentioned in the story, even specific street names like Church St., Charlotte St., and Park St. So, it’s not as if I left out Phenix entirely or that it doesn’t have a central role in the memoir. After all, the original title of the story (The Court) is named after the basketball court across the street from my house, which in itself serves as the setting for the opening scene. What’s missing is that I largely glossed over Phenix and relegated it to setting only; when, what I realize I should do, is transform Phenix from mere setting into what it more closely resembles, that of a transformative supporting character within the story. The lights had already gone out at 10:16, like clockwork, as they had for years. Hummingbird moths had vacated the area over an hour ago. The crickets crept into my consciousness playing their nighttime lullabies, as the old streetlight next to the stop sign that no one ever stopped at flickered. The light shone bright and then darkened. At that moment, I began to see and hear the ghosts of my childhood. These images were visible as if at hand only yesterday, and they winked one after the other in my mind’s eye like white stars sewn into the black velvet of the summer’s night sky. A streetlight flickering. Looking up, and seeing the stop sign that no one ever stopped at. Smiling. No longer angry. Tears still wet retreating from my eyes down my cheeks. Writing some more. If you’re from Phenix, you know exactly where I’m talking about—the curve that rests at the top of the pool hill. The stop sign. I don’t even know if the stop sign is there any more. It shouldn’t be. If a scene delivers the story from one sequence to the next, then setting, at least in the case of my hometown, illuminates in a way more than is typical, sheds light on a character. Sort of like Fargo. What’s the saying—you’re a product of your environment whether you like it or not. We none ever spoke of leaving Phenix, but we all thought about it silently. Even at a young age, we planned our escape. It came out in the games we played. The thin, lanky figure stepped to a chink in the gray-black pavement that opened like the veins of a broken waterway, spilling horizontally across the basketball court. He bent his knees. 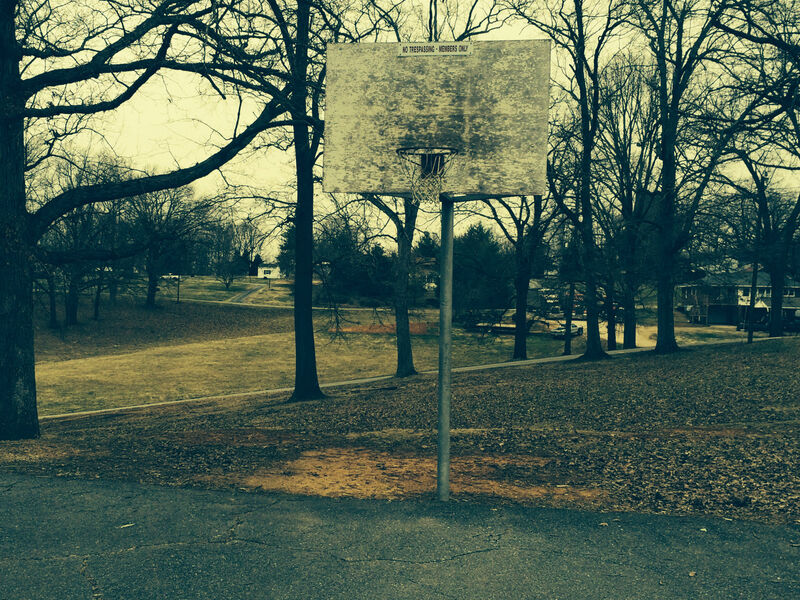 His eyes searched for a direct line to the back of the rusted hoop, and he released a jump shot. The flick of his wrist made a popping sound as his fingers pointed straight ahead. He stepped to the next marker. Each open crack in the blacktop marked a different city, a different state, a different destination we sought to go leaving this small town behind. Only one of us had accomplished the feat of going Around the World in sixteen shots or less without missing consecutive field goals. If anyone would ever escape, it would be him. I never thought I’d escape. I’m not sure I ever wanted to escape. I wanted to pause time, place it at a standstill. These were the best friends I would ever know. Life would separate us eventually. I never wanted that. It was inevitable. Death would divorce us from one another until we were strong again. Then distance would step in. Perhaps it’s a generational thing, I don’t know. I can’t speak to whether kids in the generation before, or in the generations after, feel this way, but there’s this strange pride I have in being raised in Phenix, Virginia. This badge of honor, no different than someone saying, Yeah, I grew up in New York City or Los Angeles. If you look at the aerial photo, you’ll see the center of town where the bulk of residents live, and even in that, you’ll notice mostly trees and few homes. Even the census number is bloated because it accounts for people who live on the town’s outskirts. Save for less businesses, Phenix is mostly the same as it was in the 1980s. Kids are less active to say the least, but that’s about it. And that’s where your imagination comes in. I credit my Papa Hamlett for my love of storytelling and I credit Phenix for my imagination. I never found Phenix boring. There was always something to do, somewhere your imagination could take you if you were willing to allow it. To the opening of the woods, jump the creek, and follow the stream. The entrance is lush. The smell of the forest so sensuous the aroma trickles in and out of our nostrils. We’ll follow the winding, binding curvature of the water as it flows clear. A dark shadow looms from our backside. The bank of the creek becomes steeper as we walk. We duck down and push the loose branches and vines out of our way. With thorns sticking into our sides, we have to stop a moment as our shirts become entangled by their prickly rage to depart from their link to us. The bag of lice leeches itself onto our shoestrings and the old shopping cart with its shiny, metal exterior still sits upright where someone had pushed it into the crater of the world years ago. Our feet sit at an angle as we manage to walk sideways on the auburn crumbling dirt that cakes the side of the bank that in turn fills in the little openings in our shoes as the little balls of dirt fall one after the other down the embankment. Our fortress in the woods. I lived at the basketball court. I lived in the woods. Sometimes I still do in my mind. I can trace every step now just as I could in my childhood. I would say that is so. Nice early morning read. I hope Annabelle and Henry will one day be able to reflect on their growing up years as much as you and so many others did! Friendships made will always be remembered. I think so. It’s different now than then, but it’s like that for every generation. I enjoy all of your writings! I too am proud of the fact that I grew up in Phenix without the o, or maybe I should say Old Well:) I don’t think there could be a better place to grow up. When I read your stories, I go home, and that’s my favorite place! I don’t think there could be a better place either. I’m glad my writing does that. In a way, that’s sort of my intention when I sit down to write. I know my experiences may be different, but my hope is that there will be enough similarities along the way, even if just a feeling or emotion, that it will remind the reader of a certain time and place in their life. Unfortunately, and fortunately, there is a stop light at the intersection of 47 & 360. Of course, there was an article in The Gazette! This is the worst [insert expletive here] news I’ve read on the Internet since I first dialed up in 1996. When did Charlotte County’s purity become soiled by traffic technologies such as this? This is terrible. Also, now I have to add a footnote to the blog post. You could have just left me in the dark. I’m going to write a memoir with that title one day (…And a Good Time Was Had by All). No one may ever read it and it may never be published, but I’m going to write a memoir with that title one day. Of course there was a photo!!! What else are they going to print?! Haha Sorry to ruin what we all once knew as “the only county without a stoplight!” I believe your uncle is quoted in the article several times…blame him at Christmas dinner! Ain’t nothin’ like a good ol’ fashioned family rumble! Enjoyed your story! As a child, was one of the first classes in the brand new Phenix School”..(tells you how old I am). Passed through there everyday till graduation. Like all our Southern past it stays the same while at the same time dies a little everyday. Keep writing!!! Thanks for stopping by Tina. If anything ever happens to Phenix Elementary, it’ll be a sad day. Lots of memories there — on the merry go round, playing around the giant oak trees next to the old school out back. Phenix is a special place, and always will be. A wonderful Sunday morning read! It was good to reflect upon those cherished memories of growing up in Phenix. That curve just down from my Grandma’s, also, led to the best sleigh riding around. We used to have bon fires and sled until our toes were half frozen. Coming from Phenix, you learned to appreciate the little things which mean the most like spending time with family, friends, and exploring those woods. Phenix will always be ‘home’! Haha. Me too. I may blow up this aerial photo and frame it. Apparently it was summer when it was taken because the pool is as blue as ever. I can hear your mom yelling “Jennifer, Jeffrey!” from the basketball court down to the pool.